Willem de Kooning was a Dutch-American Abstract Expressionist painter, who was born in Rotterdam in 1904 and later reached fame as a member of a group of artists known as the New York School. de Kooning can be counted amongst some of the most revolutionary painters of the last century, with the likes of Jackson Pollock, Franz Kline, Arshile Gorky, Mark Rothko, Robert Motherwell and Clyfford Still, to name just a few. September this year saw the launch of de Kooning: A Retrospective, at the Museum of Modern Art in New York. Organised and curated by John Elderfield, the exhibition is the first full-scale museum exhibition to be entirely devoted to the full scope of de Kooning's career. Almost 200 works of art have been compiled for this blockbuster show that gives a worthy overview of the artists life, struggles and artistic output. The show is installed at MoMA in chronological order, with each room giving some thought to, and a pictorial showcase of, how the artist developed and set about the challenges of being an Abstract Expressionist painter. Perhaps best known for his work in representing the figure, de Kooning's retrospective takes a deeper look at his battles with figuration and abstraction, and how he took deconstruction of the human form to new levels. Exploring the energy of the body, through dashes of lines and colour, de Kooning would set himself apart from the other big names of Abstract Expressionism through his work on the human figure. 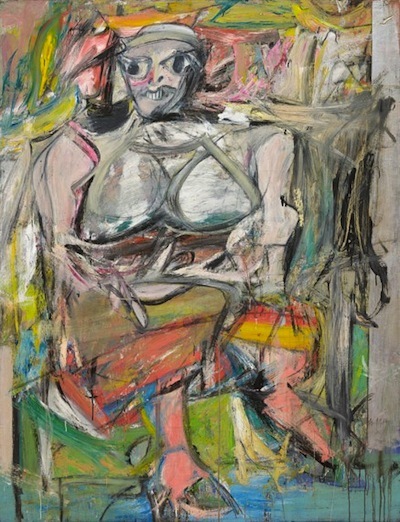 Towards the end of his life, de Kooning battled with alcoholism and dementia, and the paintings that were done during this period are often neglected or cast aside, but Elderfield has chosen to include them in this retrospective. Not only have they been included, but they are given equal consideration, allowing the public audience to make up their own minds about whether the works show the mental and physical demise of a great 20th century artist, or whether they are an equal part of his ever evolving ouvre. The show runs at MoMA, New York until the 9th January 2012.